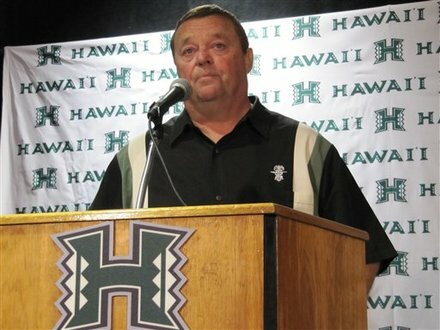 Greg McMackin's four-year tenure as the University of Hawaii's head football coach came to an emotional end Monday when he accepted a retirement offer. Star-Advertiser. University of Hawaii head football coach Greg McMackin has stepped down and will waive nearly half of his $1.1 million employment contract, he announced this afternoon. Hawaii Reporter. Despite the University of Hawaii’s football team’s losing season, an apology for a gay slur during a 2009 press conference and the recent anonymous point shaving accusation, there are University of Hawaii students who stand by coach Greg McMackin. KITV4. Despite his shortcomings on the gridiron, which included a 29-25 overall record and only one winning season in four years, University of Hawaii head football coach Greg McMackin is being hailed as a game changer when it comes to academic success. KHON2. To rein in skyrocketing school bus costs, state Department of Education officials are looking at a host of options -- from cutting routes to holding on longer to older school buses -- but stressed there is no single solution short of eliminating bus service altogether. Star-Advertiser. For the last four years, Hawaii taxpayers have paid whatever price school bus contractors asked of the Department of Education. Civil Beat. The National Oceanic and Atmospheric Administration didn't adequately inform the public about a proposal to widen protections for the endangered Hawaiian monk seal or give them enough time to comment, according to former Hawaii governor and U.S. Senate candidate Linda Lingle. Civil Beat. Overnight mail delivery in Hawaii would be eliminated and first-class mail would take one day longer to be delivered under changes proposed by the U.S. Postal Service on Monday. Pacific Business News. Researchers in Hawai`i are looking at opportunities to increase the state’s independence with regard to both energy and food. If biofuel and aquacutlure researchers are able to work together quickly, they could achieve benefits for people, the economy and life in the ocean. Hawaii Public Radio. At this time of the year, the Internal Revenue Service is not looking to be Scrooge, it wants to be Santa and return more than $153 million to taxpayers — more than $700,000 to Hawaii residents alone. Star-Advertiser. Presidential candidate Mitt Romney is attacking President Barack Obama's plans to come to his home state over Christmas. Hawaii News Now. Two dozen men -- all of them Pearl Harbor survivors from across the country -- traveled to Oahu this week to commemorate the 70th anniversary of the Japanese attack that launched the United States into World War Two. KITV4. Police Maj. Carlton Nishimura received about $6,000 a month from the operator of an illegal gambling room on Keeaumoku Street from April 2004 through March 2006 to protect the operation, and used the money to support his own gambling activities, the FBI said in court records a federal judge unsealed last week. Star-Advertiser. An aging Marine Corps CH-53D Sea Stallion helicopter crashed March 29 in Kaneohe Bay as a result of a "catastrophic mechanical failure," a portion of the official investigation concluded. Star-Advertiser. The Korean developer of the Hale Ka Lae luxury condominium project in Hawaii Kai has put construction on hold indefinitely because of “financial constraints from the weakening global economy.” Pacific Business News. Watch out for injured or disoriented native seabirds, especially in Windward Oahu. Wildlife experts are asking for help rescuing native Wedge-tailed shearwaters. Hawaii News Now. Astronomers using the Gemini North telescope on Mauna Kea have found what they say are the two largest black holes ever measured in Earth's "cosmological neighborhood." West Hawaii Today. Two more Big Island residents have announced their intentions to run for County Council next year. West Hawaii Today. Hawaii County government has stripped the meeting notices from its online calendar, even as a national group gives the county a C-minus on website transparency. West Hawaii Today. Organizers of the Laupahoehoe charter school have asked the Hawaii Board of Education to once again overrule the state's charter school advisory body, this time over a disagreement surrounding the timing of elections of permanent school board members. Tribune-Herald. Mayor Alan Arakawa's television call-in show "Your County with Mayor Arakawa" will be shown at 7 p.m. Wednesday on Akaku Channel 53. Maui News. State Office of Hawaiian Affairs officials presented a proposed settlement to Native Hawaiians on Friday night in which the agency would receive $200 million in Honolulu real estate for revenue generated on Hawaiian monarchy lands. Maui News. The Kaua‘i County Council on Thursday passed the 2012 Hawai‘i State Association of Counties Legislative Package, a collection of 14 state proposals to be considered by all four counties’ councils. Garden Island. The County Council Chairman, a County Deputy Prosecuting Attorney and a former Salary Commissioner addressed matters of budget protocol to the County Salary Commission at its Dec. 2 meeting. Garden Island. Not all members of Kaua‘i Island Utility Cooperative are accepting of the co-op’s plan to replace ratepayers’ existing electricity meters with smart meters, which will transmit real-time usage information to the utility wirelessly. Garden Island.